Trevor Pateman's Philately Blog: Postmaster or Philatelist Provisionals? The imperforate Russian Imperial Arms stamps issued by the Kerensky [Provisional] government in 1917 were occasionally perforated locally by postmasters, private companies or by philatelists. Unfortunately, you probably need several examples to establish to what category a perforation belongs, though if you have a Money Transfer Form or Parcel Card it is almost certain that you are looking at a Postmaster Perforation. Normally, it's not that easy. 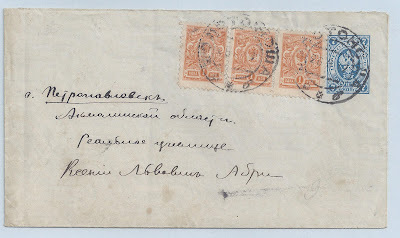 Above is an ordinary letter from ZOLOTONOSHA [ Polatava Gub.] 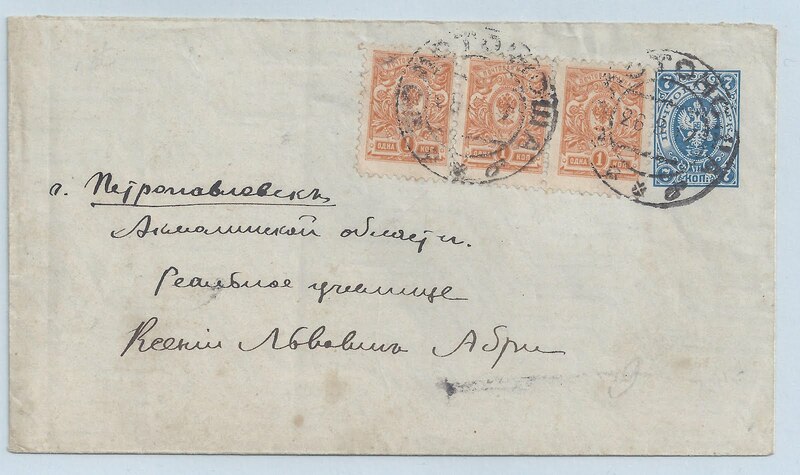 26 8 17 addressed to Petropavlosk in Akmolisnk Guberniya - there is a weak receiver cancellation on the reverse dated 3 9 17. The 7 kopeck stationery envelope has been uprated with a strip of 3 imperforate 1 kopeck stamps which have been neatly perforated 11.5 [line perf I think]. It is impossible to say who did this in the absence of more examples.